Add cleaner, pump it and continuously spray with one trigger squeeze! The Kwazar Venus Pro+ Heavy Duty Sprayer Acid is a chemical resistant pressure sprayer that allows you to apply your favorite acidic chemicals safely and easily! Add your favorite cleaner to the reservoir, pump it and spray continuously! Many chemicals, like wheel cleaners and degreasers, can have an acidic base, which allows them to quickly and easily break down nasty dirt, grime, brake dust, etc. However, this type of cleaner can negatively affect spray bottles, rubber seals, spray triggers, gaskets, etc. 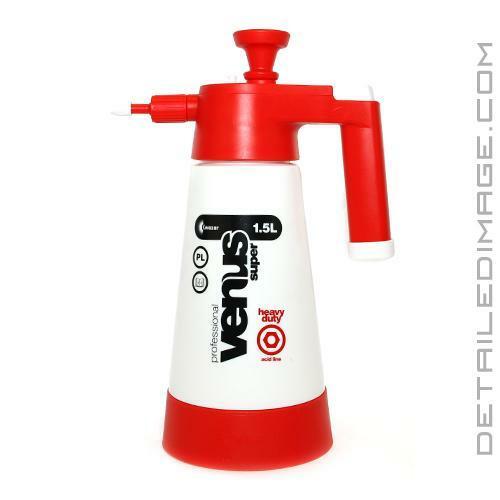 The Venus Pro+ is chemical resistant, allowing you to not have to worry about your favorite harsh chemical ruining this bottle! Simply pump the bottle until the desired pressure is achieved, press the thumb trigger at the top of the handle, and spray your wheel cleaner, degreaser, etc. until you need more pressure. The limited trigger pulls required allows you to save valuable time and effort while detailing as well. If you are looking for a bottle strong enough to resist your favorite acidic cleaners, the Kwazar Venus Pro+ Heavy Duty Sprayer - Acid is a great choice! Using a solvent based cleaner? The Kwazar Venus Pro+ Heavy Duty Sprayer - Solvent is also available! This is awesome sprayer! Definitely holds up to acid for wheel cleaning and super degreaser. Saves the forearm as well.